I feel like I've been playing catch up in all areas of my life lately -- not only with my knitting, but day-to-day tasks like renewing the gringa.org domain (my apologies to those who tried to visit while it was down!). A friend of mine was expecting a baby girl in late winter/early spring, so I made her a sweet little newborn hat out of light-weight Gedifra Wellness. This would have been perfect... if I had sent the cap to my friend before her baby was born. But noooooo, I put it off and put it off. About two weeks ago, I got an e-mail from my friend that the baby had arrived safe and sound three weeks prior. They live in Atlanta, and all of my procrastinating means that they are well into the way-too-hot-for-a-baby-hat weather. Keeping to my policy that baby blankets should be machine washable, I grabbed some Lion Brand Baby Soft and cast on. 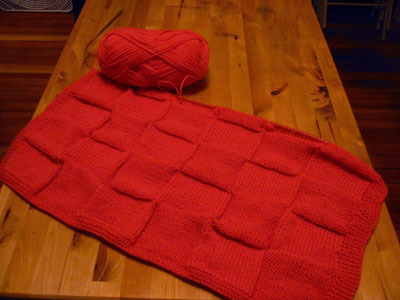 I started knitting the lacy blanket pattern printed on the inside of the ball band, but I kept messing it up. I converted the pattern to a simple stockingette/reverse stockingette checker-board and off I went!